It's the most important rule of scuba diving: If you don't feel right, don't go down. So after her father falls ill, twelve-year-old Julie Sims must take over and lead two of his clients on a dive miles off the coast of Alabama while her father stays behind in the boat. When the clients, a reckless boy Julie's age and his equally foolhardy father, disregard Julie's instructions during the dive, she quickly realizes she's in over her head. And once she surfaces, things only get worse: One of the clients is in serious condition, and their dive boat has vanished—along with Julie's father, the only person who knows their whereabouts. It's only a matter of time before they die of hypothermia, unless they become shark bait first. Though Julie may not like her clients, it's up to her to save them all. Watt Key, an expert SCUBA diver, lives in southern Alabama with his family. His debut novel, Alabama Moon, was named to Time Magazine's list of the Best Hundred YA Books of All Time. 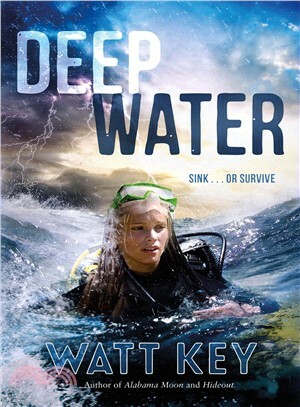 Deep Water is his sixth book for young readers.